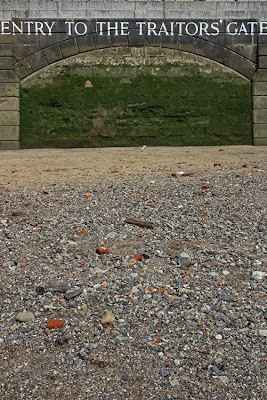 The piece of Thames foreshore directly in front of the Tower of London, once Londoners' own bit of seaside, is now generally closed to the public. 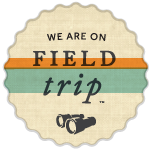 However, we can access it for a few days each year during the Festival of Archaeology. Don't take your bucket and spade, since digging is not allowed! Instead, you get to do something even more fun: comb the foreshore for interesting finds, and then have them identified by the team of archaeologists. 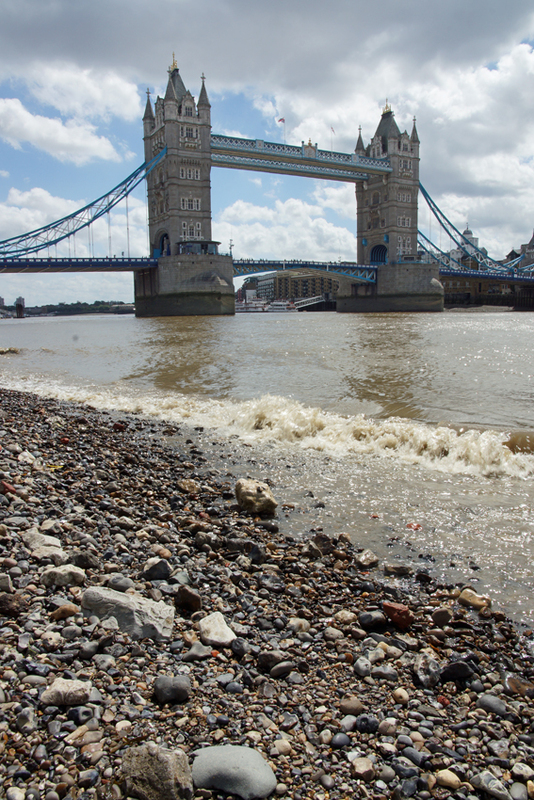 The Thames has been receiving Londoners' treasures and rubbish alike for several millennia, so there are plenty of fragments washed up onto its foreshore. 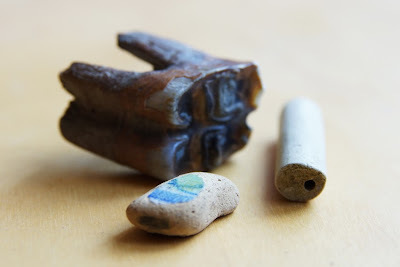 My own finds from this weekend won't exactly make historical waves - a cow's upper molar, a fragment of Delftware, a few clay pipe stems - but there's still something exciting about finding (part of) something used by Londoners several centuries ago. There's also the joy of seeing some familiar landmarks from a new viewpoint. Traitor's Gate is a stern reminder of the earlier history of this spot, while Tower Bridge looks good from any angle! 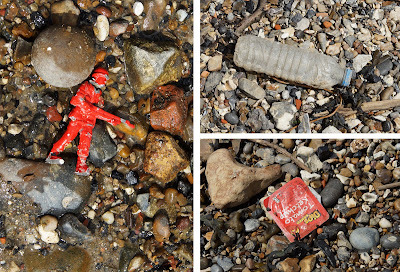 Finally, what modern artefacts will future archaeologists find? If the current contents of the beach are any clue, there will continue to be glass and crockery - but also plenty of plastic. 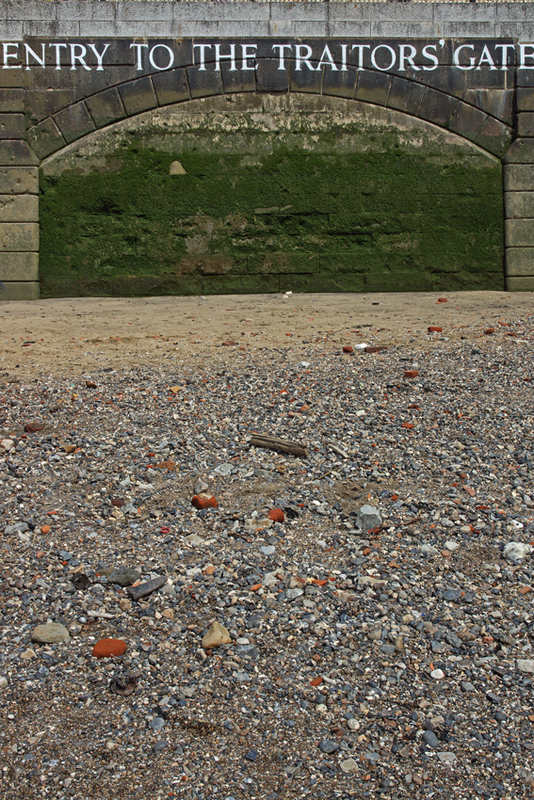 If you're tempted to go down to Tower Beach, next year's Festival of Archaeology will be on 12-27 July 2014; the Tower's archaeology weekend is usually at the end of that period. 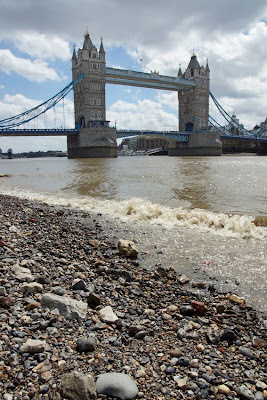 To explore the Thames foreshore throughout the year, join the Thames Discovery Programme's events. This summer, the South Bank Centre is holding a Festival of Neighbourhood. As well as asking visitors general questions about what makes a neighbourhood, it devotes several weekends to specific London areas. 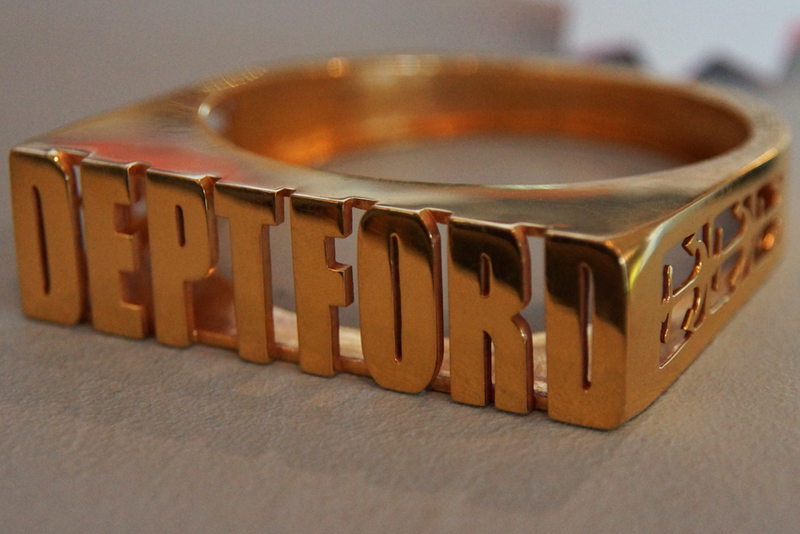 This weekend, the attention is on Deptford. The foyer of the Royal Festival Hall has photos, a 'market' of local organisations, and artwork. 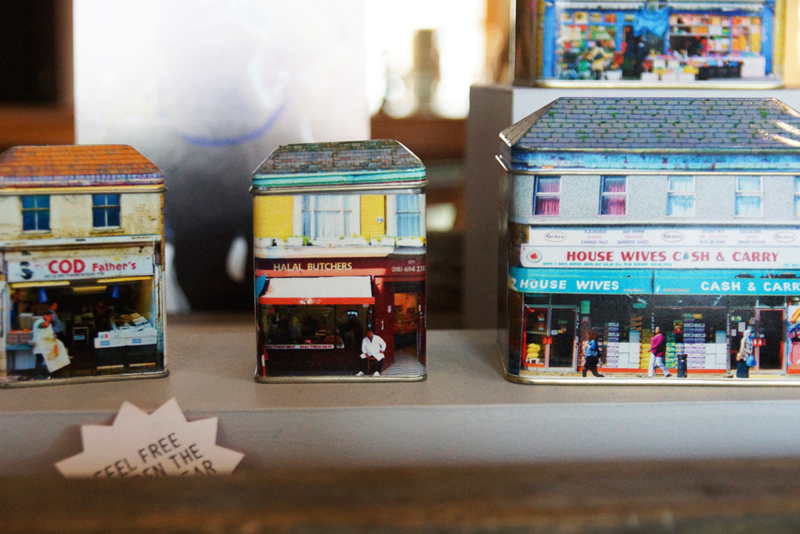 Among my favourites were tins representing High Street shops; open them, and you can hear noises recorded in their real-life counterparts. 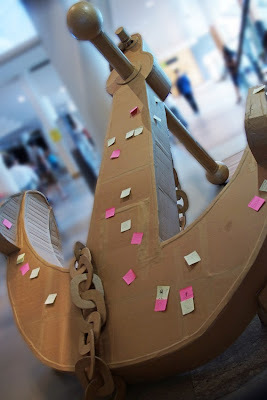 Many Deptford residents and visitors will also recognise the replica anchor: it's a cardboard representation of the real anchor which used to be at the end of the High Street. 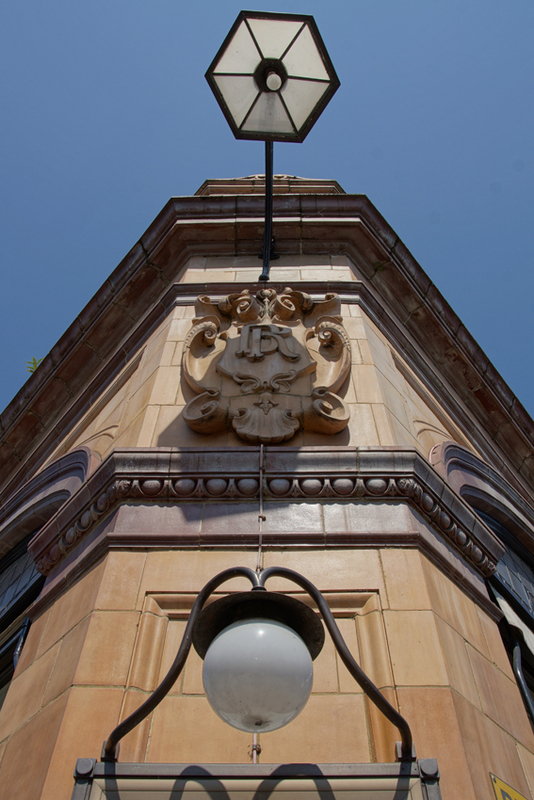 This symbol of the town and its fascinating, complex past was taken away by Lewisham Council as an 'improvement' and whose return is uncertain. The post-it notes on its cardboard facsimile bore visitors' thoughts; overwhelmingly, they amounted to 'put it back!'. There are performances by Deptford artistes and groups throughout the weekend, also in the Royal Festival Hall foyer. 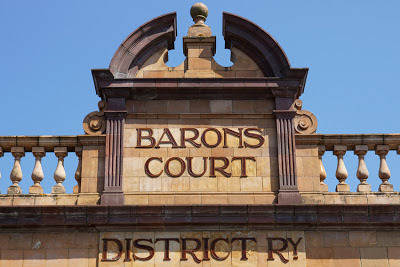 For locals, it's fascinating to see how our neighbourhood is represented in this national venue; for those who haven't yet ventured into SE8, it's a sample of what you are missing! If you're on the platform of East Ham underground station today, then you'll only have a cup of tea if you brought it with you. However, in the past, you could have bought it from this small brick building for a reasonable-sounding tuppence. 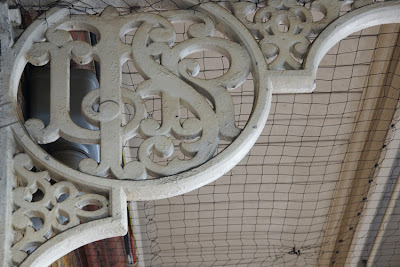 There is another treat here for fans of old signage: the ironwork bears the letters LTSR. These were the initial of the London, Tilbury and Southend Railway which opened the station in 1858. 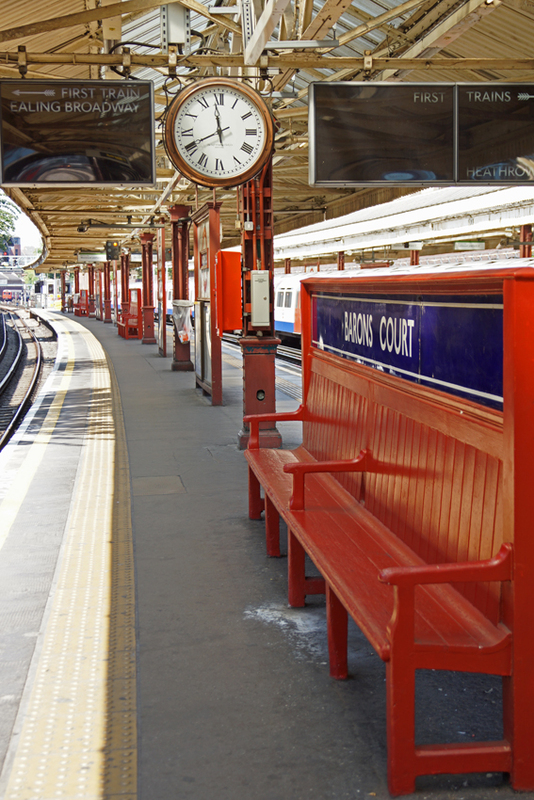 Its current user, the District Line, has served it since 1902. 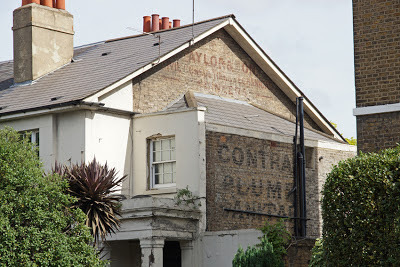 Further viewing: see this ghost sign and all sorts of other interesting District Line features on the Secrets of the District Line video at Londonist. 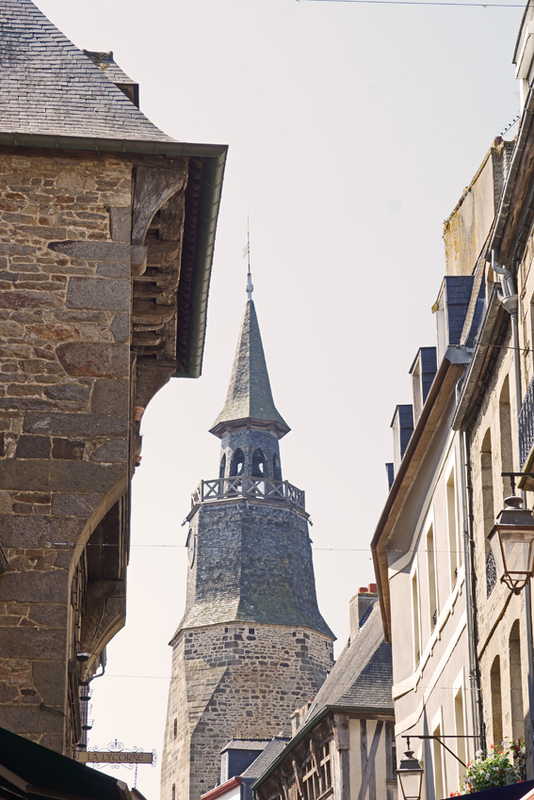 The Breton town of Dinan is at the tidal limit of the river Rance, and this favourable position made it a wealthy trading town in the middle ages. 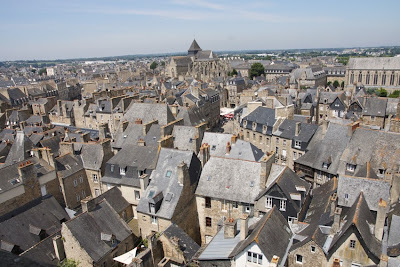 In the fifteenth century, the municipal authorities decided to build a tower which would dominate the town and serve as watch-tower, council building and bell-tower. The town's archives were stored here and meetings held here until the Revolution, when confiscations made larger and more suitable premises available. 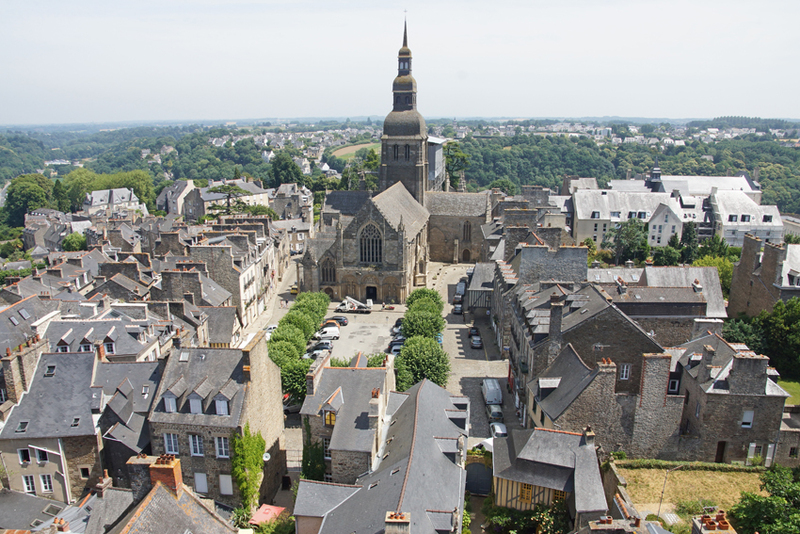 It remained the highest point of the town until the nineteenth century, when the spire of the church of St Sauveur reached a little higher. 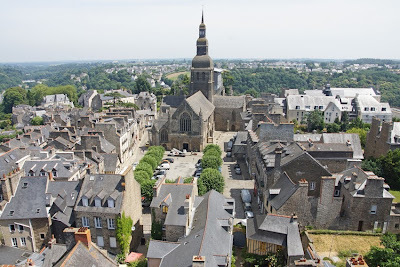 The tower continued to be a watchtower, particularly useful for spotting fires, but in 1937 it opened to the public and now offers visitors impressive views over Dinan. 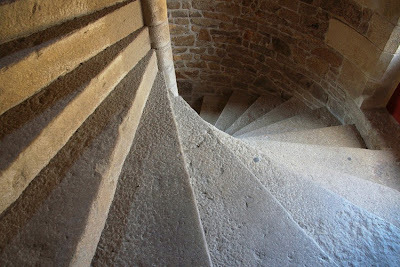 However, the interior also deserves attention - and not only because the stone steps give way to steeper wooden ones and finally to an unnerving near-ladder. It also contains historical information and, most excitingly, a clock movement dated 1498. Duchess Anne of Brittany authorised the installation of a clock in 1507 - making Dinan the third Breton town to be allowed to do so. Indeed, this clock's new home became known as the Tour de l'Horloge (the Clocktower). The mechanism was made by M Hamzer, a German clockmaker working in the Breton city of Nantes. It was used until 1847, although it had undergone some modifications, the first in 1657. 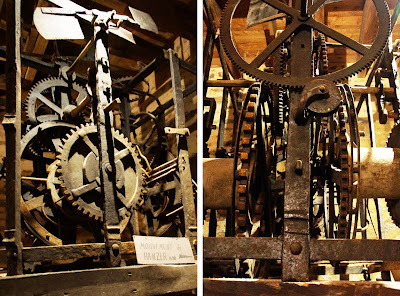 The workings are of wrought iron, and included an hour hand (but no minute hand) and a chiming mechanism. Its replacement continues to strike the hours and quarters - quite an experience when you're stood alongside the bells at the top! 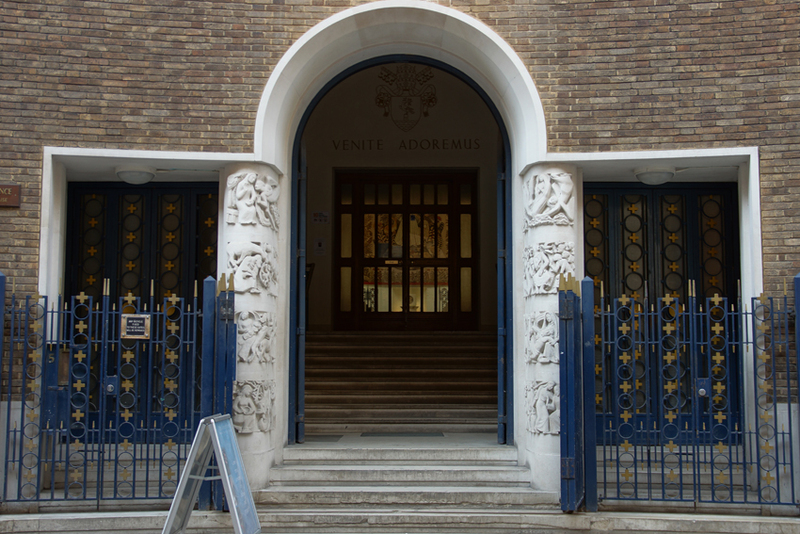 Notre Dame de France is a Catholic church on Leicester Place, just off Leicester Square. Its exterior is perhaps interesting rather than exciting, but the interior is wonderful. The church, which offers masses and services in French, came to this site in 1865 when it took over the premises of Burford's Panorama. Such panoramas, large painted scenes offering a 360-degree view of battles and far-away places, had been popular entertainment, and worked best in a round building - so the church would also be round. However, the cast-iron Victorian church was destroyed by bombing in 1940. 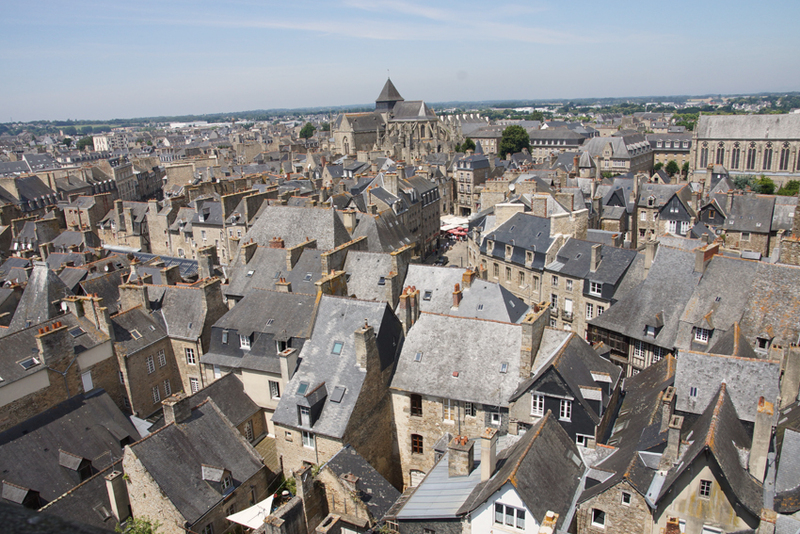 It was rebuilt after the war ended, and reconsecrated in 1955. 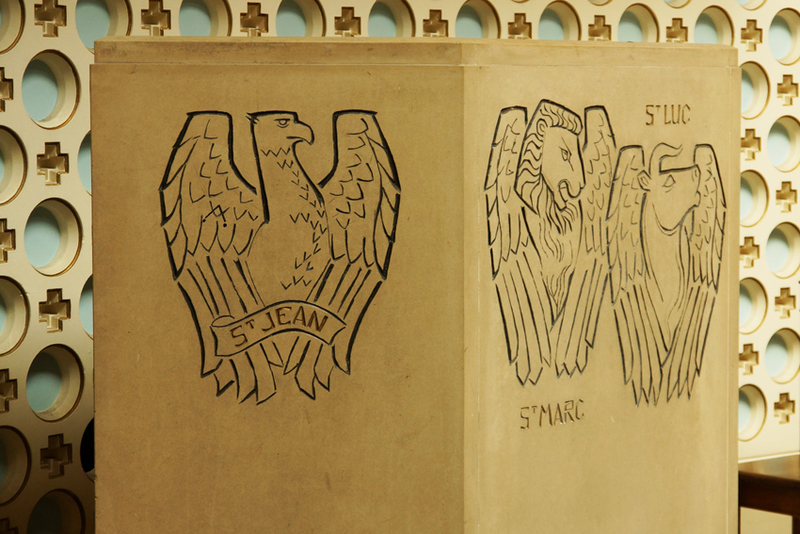 The French Cultural Attaché René Varin was keen for it to be decorated by eminent artists, to honour France. As a result, there are extraordinary decorations throughout the church. 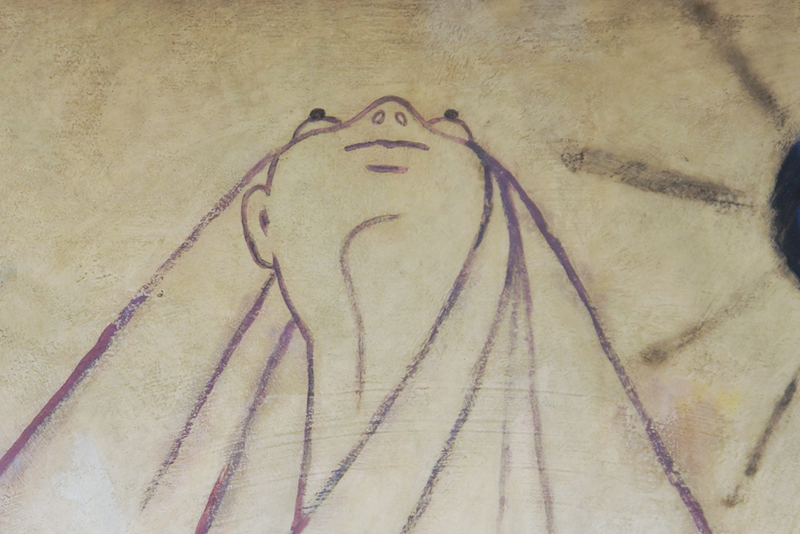 The first to be noticed by the visitor is a tapestry hanging behind the altar. 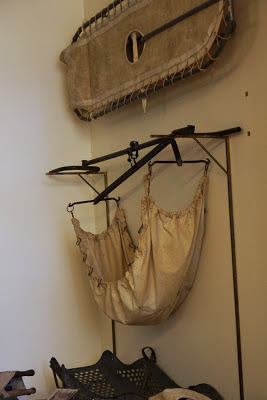 It was designed by a Benedictine monk, Dom Robert, and woven in Aubusson. Its theme is paradise on earth, with Mary as the New Eve. 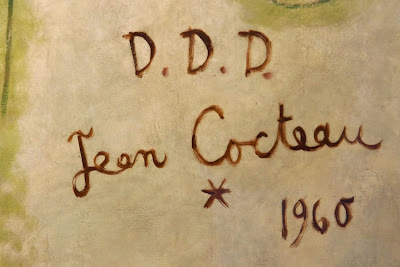 However, the most famous part of the church is the side chapel, decorated by Jean Cocteau. 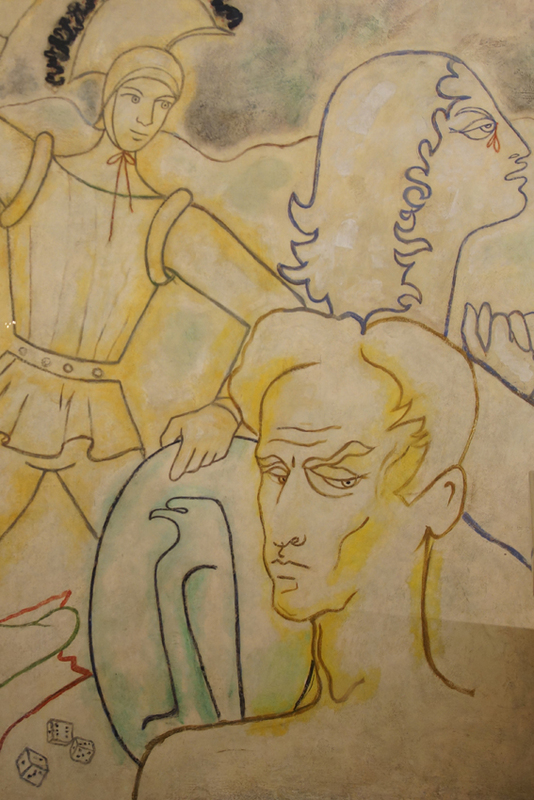 He painted the murals over the course of a week in November 1959; famous for his poetry, novels, plays and films, he had to be protected from press attention while he worked. 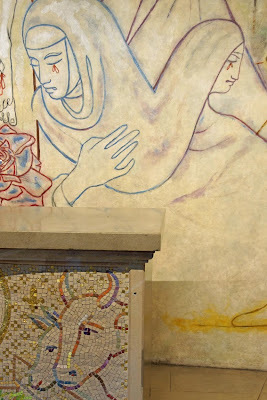 Depicting the Annunciation, Crucifixion and Assumption, the murals are extraordinary and full of unsettling detail. 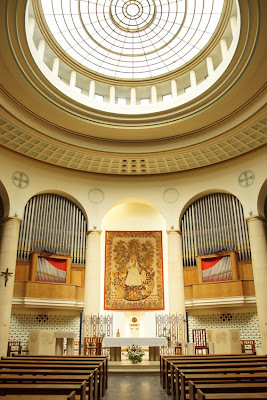 The chapel's altar is decorated with a mosaic of the Nativity by a Russian artist, Boris Anrep, who would also work at Westminster Cathedral and the National Gallery. 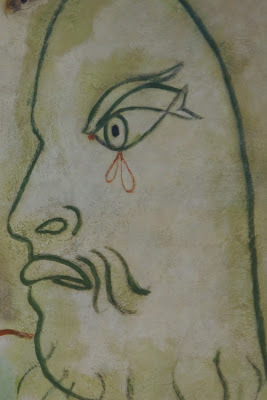 He had completed this work in 1954, only to have it covered with a panel painted by Cocteau. 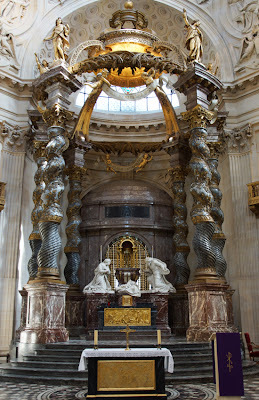 The decision to conceal his work distressed him; sadly he died before it was revealed again during a 2003 restoration. 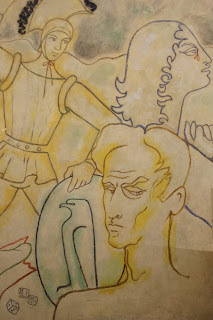 (Cocteau's panel remains on display, on a nearby wall.) Despite this unfortunate history, the mosaic and murals actually complement each other well. Having been vandalised before the restoration, the chapel is now protected by screens. While awkward for photography, they don't hinder the visitor's view too badly. Look out for Cocteau's self-portrait within the crucifixion scene. 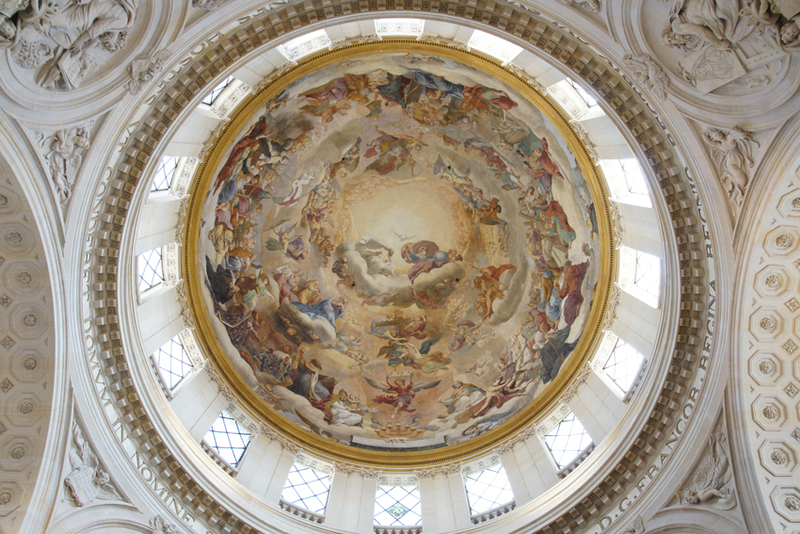 With light streaming through the top of the dome, and art on all sides, the church offers a calm and serene space between Leicester Square and Chinatown - as well as an intriguing artistic experience. 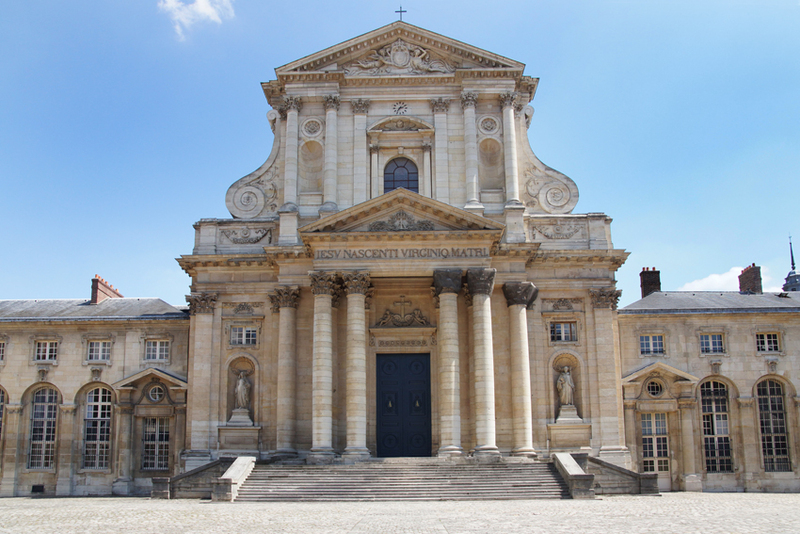 Paris is well-supplied with grand buildings, among them the less well-known Hôpital du Val-de-Grâce. 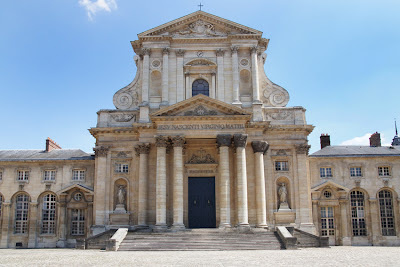 Accessed through a side-street and facing onto a small square, it is nonetheless so imposing that as I photographed it, a lost tourist asked me if it was the Sorbonne. Originally built as a convent under the patronage of Anne of Austria, wife of Louis XIII, Val-de-Grâce dates from the early seventeenth century. It suffered less than other religious buildings during the Revolution as its nuns provided medical care to revolutionaries. However, it was converted from a convent to a military hospital, and then evolved into a school of military medicine. 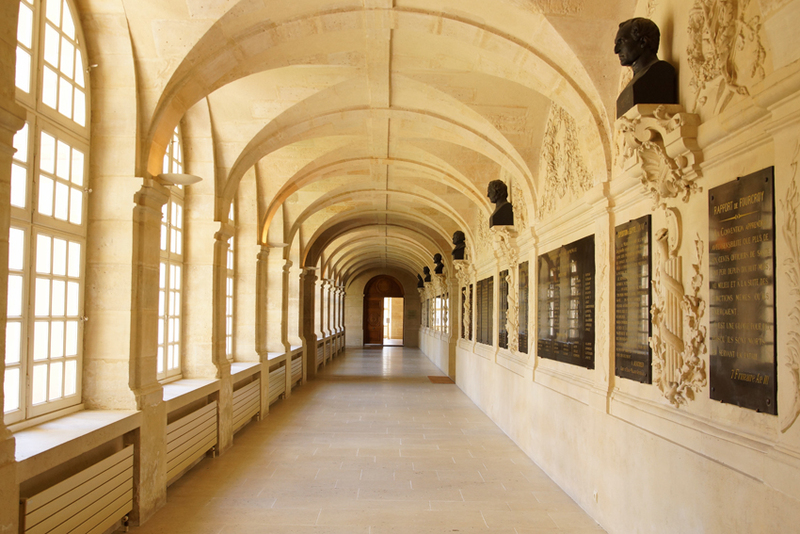 During the First World War, a museum was created; now expanded, the Musée du Service de Santé des Armées (museum of the Army Health Service) is open to the public. 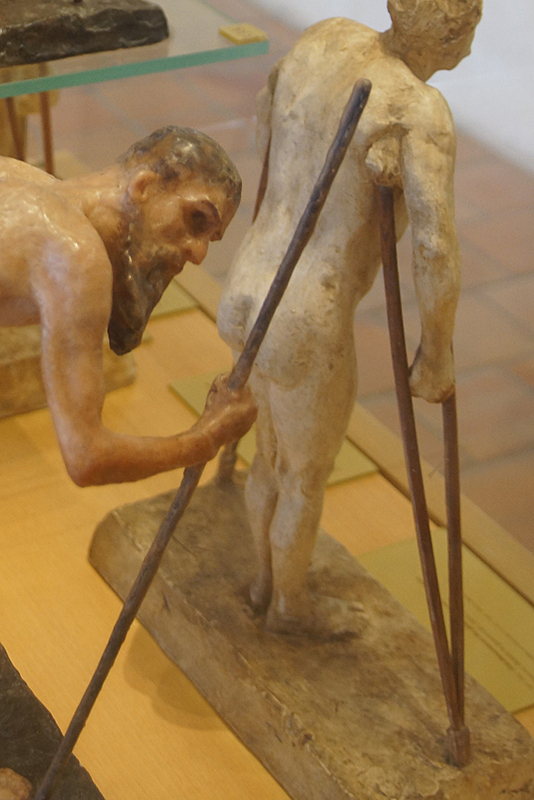 The first exhibits are from the collection of Dr Debat, and illustrate the history of medicine in general. The Museum then turns its focus to the Army medical service which was officially founded in 1708. It explores the developments and innovations made by the service, not only in treating casualties but also in transporting them from battlefield to dressing-station and beyond. 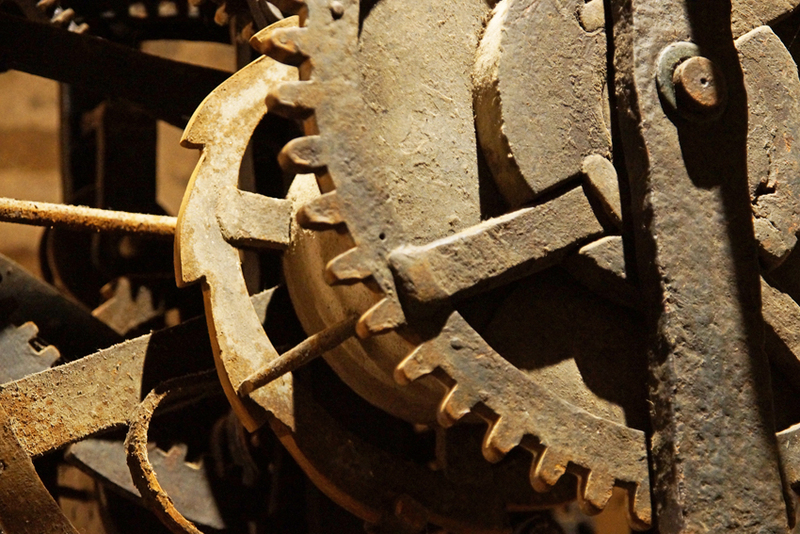 Some of the most extraordinary exhibits are those relating to the First World War. In response to the horrific injuries suffered in this conflict, various areas of medicine developed. 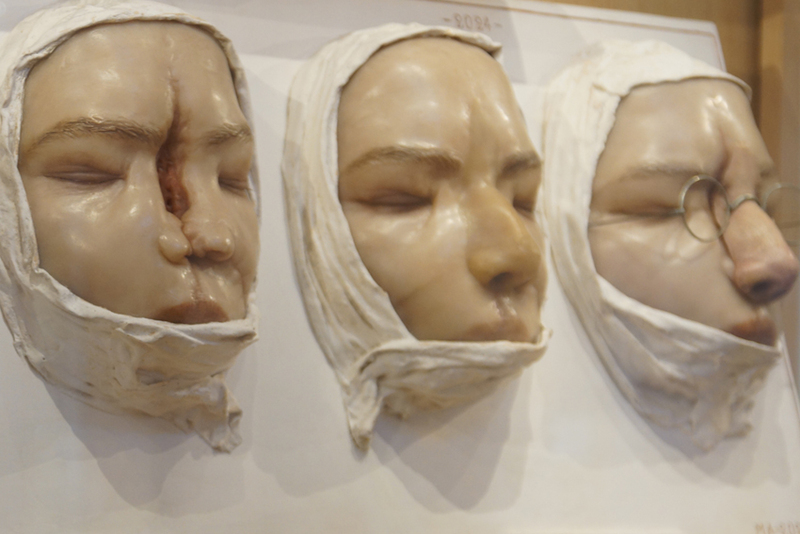 One of these was reconstructive surgery, and wax casts record some of the facial surgery undertaken. Another was the treatment of psychological conditions ('shell shock'), and an extraordinary display shows models of men with various forms of paralysis. In each case, the cause was psychological, not physical. At the same time, we are reminded how recent much progress is. 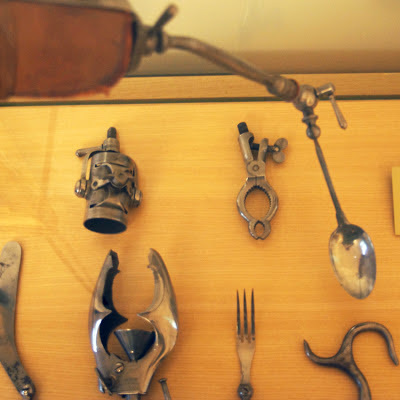 For example, a prosthetic hand of the period may have been more sophisticated than its predecessors, but it still required the user to change an attachment every time they undertook a different task. As part of the army, the health service was of course involved in France's colonial activities. The museum addresses this by concentrating firmly upon public health work, in vaccination and in fighting epidemics. This was not purely humanitarian, but also seen as important in winning the trust of local populations. At the end of the visit, there is a complete change of tone. In the heart of Val-de-Grâce, the baroque interior of its church has survived intact. 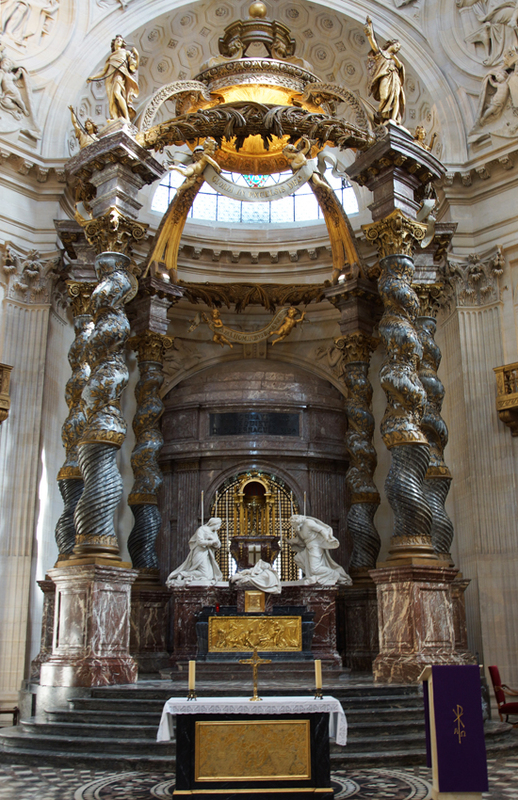 It was built by Anne of Austria in thanks for her son, the future Louis XIV, who was born after 23 years of marriage. 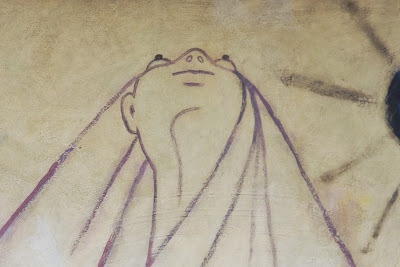 Building did not begin until the child was seven: the church was so costly that it had to wait until she became Regent, with control of the Royal budget! 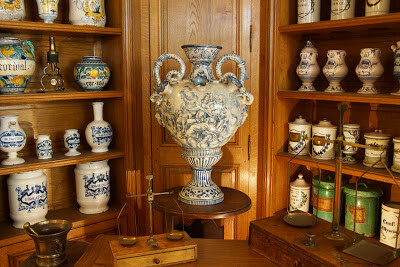 Practical information: Le Musée du service de Santé des Armées,1 Place Alphonse Laveran, 75230 Paris. Open Tuesday-Thursday, Saturday, Sunday, 12-6pm. Admission charge. 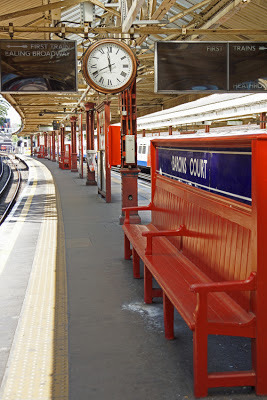 Even passing through Barons Court underground station, there are eye-catching features, including its unique benches and the apparently-missing apostrophe. 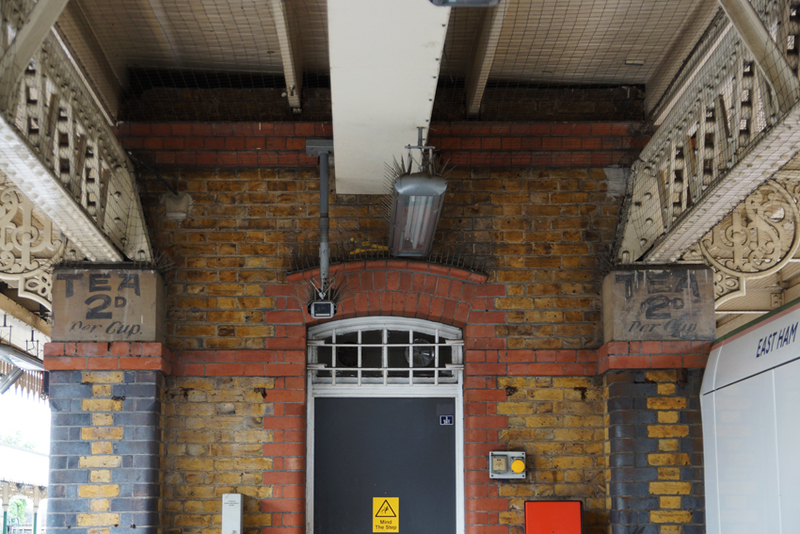 Get off the train, take the stairs to ground level, and the station building is a real gem. 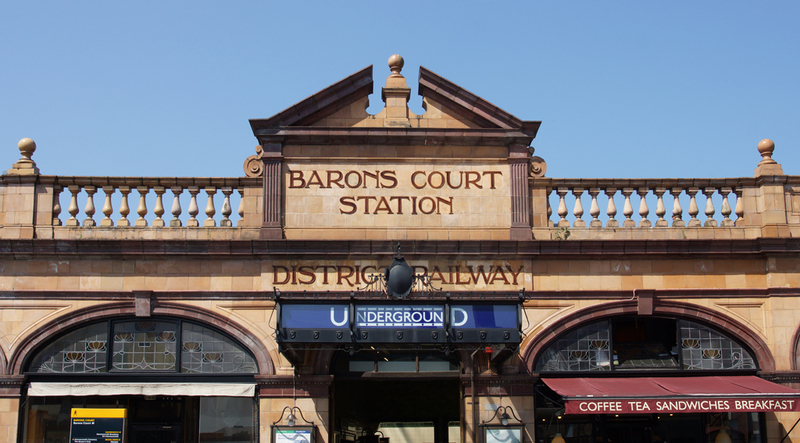 It opened in 1905, designed by the District Railway's architect Harry Wharton Ford. 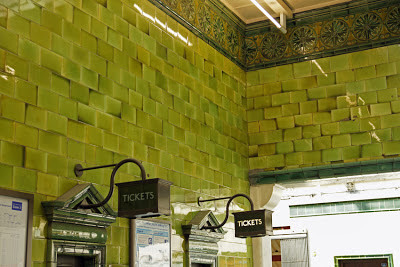 Its light terracotta cladding is typical of his stations, and covers a metal frame. The wonderful lettering caught my eye immediately. More subtle, but also appealing, is the District's monogram at the corner of the building. The building houses several shops, all with stained glass in the upper windows. Its sinuous Art Nouveau flowers are a lovely complement to the decoration, particularly the equally elegant and curving lettering. In the ticket hall, the Edwardian green tiling is another striking element of the decoration. As for that apostrophe, it isn't really missing at all. When the original line was built in 1874, this area was still mostly fields, but the station became necessary when Sir William Palliser developed the estate with housing. 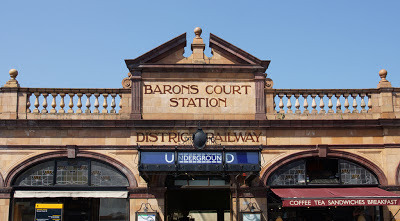 A new development and a new station required a new name: Barons Court was given either to complement the nearby Earl's Court or, more likely, because of Palliser's connections to the Baronscourt Estate in Ireland. 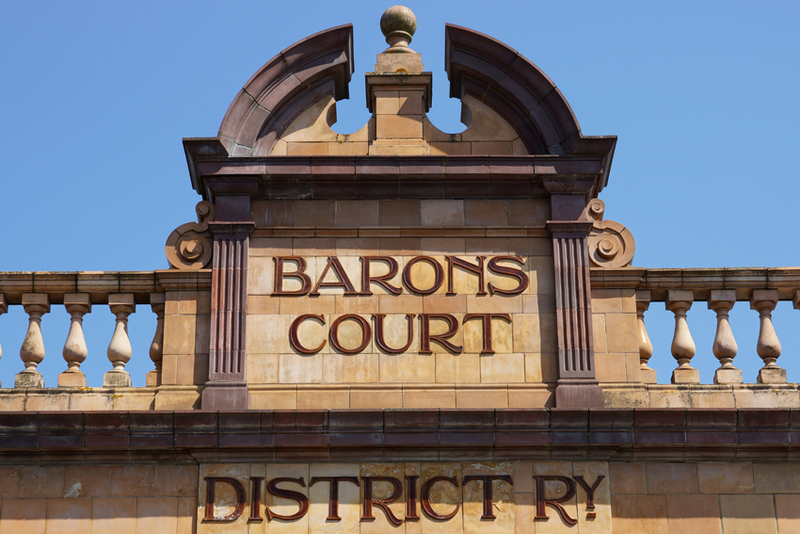 No barons, no possessive apostrophe! 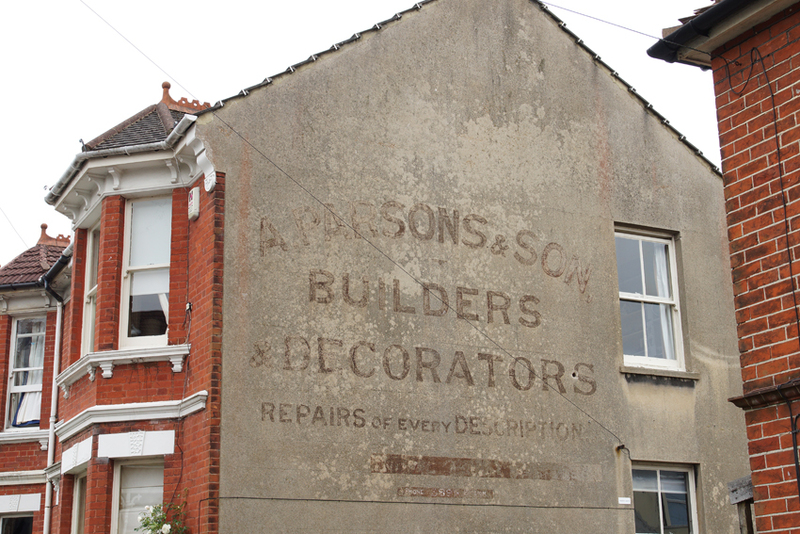 I've been up and down Blackheath Road any number of times, but hadn't spotted this ghost sign until I walked past it a few days ago. That's perhaps not so surprising: its location on the side of the building, with another house alongside and luxuriant plants in front, mean it's not exactly conspicuous. That suggests that these were the business premises: it's hard to imagine the wall as a paid-for advertising site. Indeed, the 1911 census confirms that the house was occupied by the Taylor family. Head of household Edwin Taylor was an auctioneer, but his 21-year-old son Hugh was already an engineer. Presumably it was Hugh who went on to build an engineering business here with his own son, suggesting that the sign is from the 1930s or later. The right-hand side of the sign is no longer legible, but enough remains to give a sense of what was being advertised. On the triangular gable, 'Taylor & Son. Civil [illegible] mechanical engineers' was painted in red-brown. Below, larger black letters spell out 'Contra... Plumb... Sanitar...' suggesting a plumbing business as well as the engineering one. 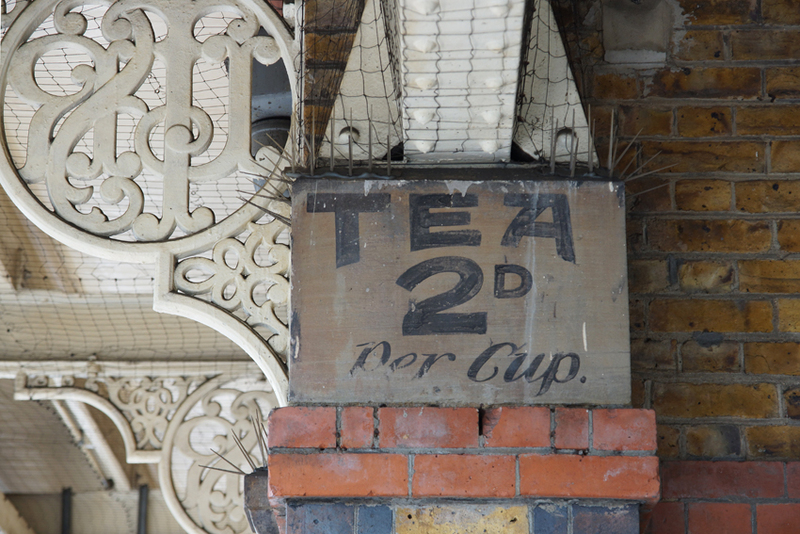 This sign is in the Preston area of Brighton - a village officially incorporated into the seaside town in 1928. Thus the telephone number at the bottom of the sign appears to read 8899 Preston. The name of the company is mentioned in Kelly's Directory for 1918 and a building plan submitted to Steyning East Rural District Council in 1927, so they were active at this period. They don't appear in the 1930 edition of Kelly's Directory. The sign at first appears rather plain, with text reading 'A Parsons & Son, Builders & Decorators, Repairs of Every Description'. However, a closer look shows some flourishes attempted in the lettering.